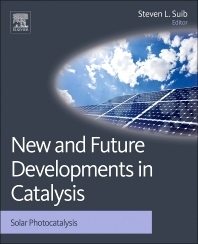 New and Future Developments in Catalysis is a package of seven books that compile the latest ideas concerning alternate and renewable energy sources and the role that catalysis plays in converting new renewable feedstock into biofuels and biochemicals. Both homogeneous and heterogeneous catalysts and catalytic processes will be discussed in a unified and comprehensive approach. There will be extensive cross-referencing within all volumes. The use of solar energy during various catalytic chemical processes for the production of an array of chemical products is the theme of this volume. Photocatalysis is a topic of increasing importance due to its essential role in many of today’s environmental and energy source problems. The use of solar energy for catalytic reactions results in a carbon dioxide–neutral process. All photocatalytic processes and the future developments in this area are discussed, including an economic analysis of the various processes. Steve Suib is one of the leading figures in solid-state catalysis and renewable systems in the US. His 450 publications, 40 patents, and authorship on multiple books on the topic of catalysis is proof of this, as is his distinguished Professor status. He is also editor for Microporous and Mesoporous Materials, which puts him in a perfect position to keep abreast with current developments in the area. He has been a prominent and prolific catalysis researcher for many years encompassing all aspects of the fields from synthesis, characterization, catalysis, to applications. He easily works in both basic fundamental academic research as well as applied industrial research. Board of Trustees Distinguished Professor, Director, Institute of Materials Science, University of Connecticut, USA His expertise is in the field of solid state inorganic chemistry including studies of zeolites and microporous materials; physical chemistry; environmental chemistry including green syntheses, heterogeneous catalysis; plasma chemistry and catalysis; semiconductors; inorganic photochemistry; photocatalysis; batteries; ceramics. Preparation and characterization of these systems using structural, crystallographic, surface, electrochemical, luminescence, microscopic and EPR techniques.